Sue the fashionista – Advice for women who want to stay stylish! Advice for women who want to stay stylish! For the Animal in All of Us! I could make an entire wardrobe out of neutrals. When you are planning a travel wardrobe what do you stick to: neutrals. What is a typical French woman’s wardrobe based on: neutrals. And the best thing about neutrals is that absolutely every woman, no matter what age or what size, looks fabulous in neutrals. What are the New Neutrals of spring 2019? Well they are more than Khaki, Beige and Black, although they do contain that. This season add Red, Navy, Pink and even Yellow. Neutrals is every color for Spring 2019 that can be worn head to toe or mixed with the classic neutrals of Black, Khaki, Beige and Denim. This really opens up a lot of possibilities if you like to stick to a fairly conservative wardrobe. And if you are like me and prefer solid color clothing to prints, then this trend is one you can wear for the entire season. And if you get brave you can take a print from one of the other trends and add it back in too. That is the beauty of the New Neutrals! One of the key features of the New Neutrals is how you put your outfit together. One of the best places to buy a neutral wardrobe is Banana Republic or Aritzia, both have so many solids in so many color options. The key to a great neutral wardrobe is what your final top piece is, both BR and Aritzia have great options. One of the key pieces for spring is a classic trench coat. Why not try one is a little bit of an unexpected color? These two coats are from BR. If we follow our New Neutral guide both of these colors look great head to toe, and work perfectly with Black, Khaki, Beige and Denim. As the weather gets warmer they both look great with White too. Aritzia has softer trenches that can be worn inside as well as outside like Wilfred Pelat Trench that comes in Moroccan Spice and Soft Birch. 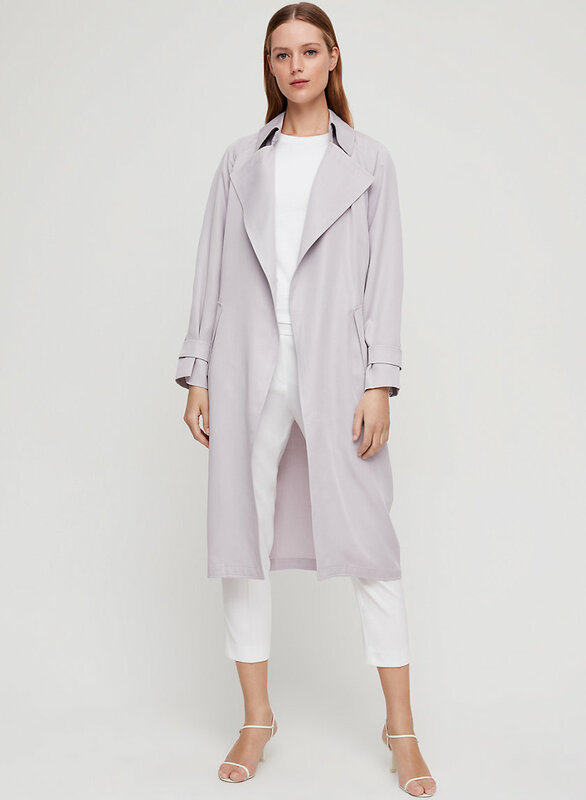 Or go for an even softer trench look in Vancouver’s Spring Uniform coat, Babaton’s Lawson Trench coat, it’s available in 6 colors and you can wear it everywhere. The last outerwear/indoor wear piece I want to talk about in a Neutral wardrobe is the denim jacket. A great classic denim jacket can take you everywhere. Anthropolgie has Levi’s Ex-Boyfriend Denim Trucker Jacket, which is about as classic as you can get and I wear my denim jacket (mine is from BR) all the time. If you already have a classic denim jacket perhaps this is the year you buy a white denim jacket, they are everywhere and will work with a neutral wardrobe as well. Another great piece in a good neutral wardrobe is a great neutral jumpsuit you can wear anywhere. Stick to jumpsuits that are a solid color and fit you like they were made just for you. BR has some great jumpsuits, this season wide legs are making a strong statement, especially cropped wide legs (in the right proportion everyone can wear them), so why not try BR’s Sandwash Modal Cropped Wide-Leg Jumpsuit. It comes in 3 neutral colors and is easy care and easy wear. Or try an Anthro jumpsuit in a new neutral color of Red. 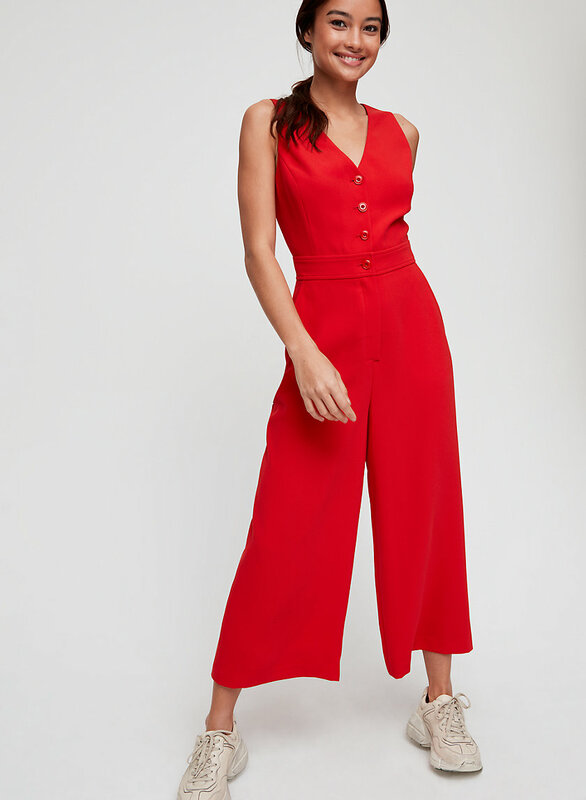 Red, in the Cathy Structured Jumpsuit, is one of my favorite new colors for spring and the key to jumpsuits for women over 40 is to make sure you can wear a bra with it. So both of these work perfectly. One other Anthro jumpsuit I want to show is the Colleen Stitched Jumpsuit. It’s classic enough to wear everywhere and it has a great ponte fabric that keeps its shape! Pants and skirts in this trend are color based and trend based, so in other words it is the styles that are in fashion this Spring but done in New Neutral coloring. One of the key pieces for new spring pants is the wide leg pant, cropped or long. Aritzia has you covered with Wilfred’s Faun Pant it comes in 7 great Neutral colors including Tuscan Sun. Or try a full length pant from Aritzia this is the Wilfred Cezanne Pant and it comes in 3 soft neutral colors. For spring pants keep your waist a little higher, that goes for your denim too. And if you are short-waisted like me, you can wear a high waist pant just with no belt detail, keep the waist elastic or simple. 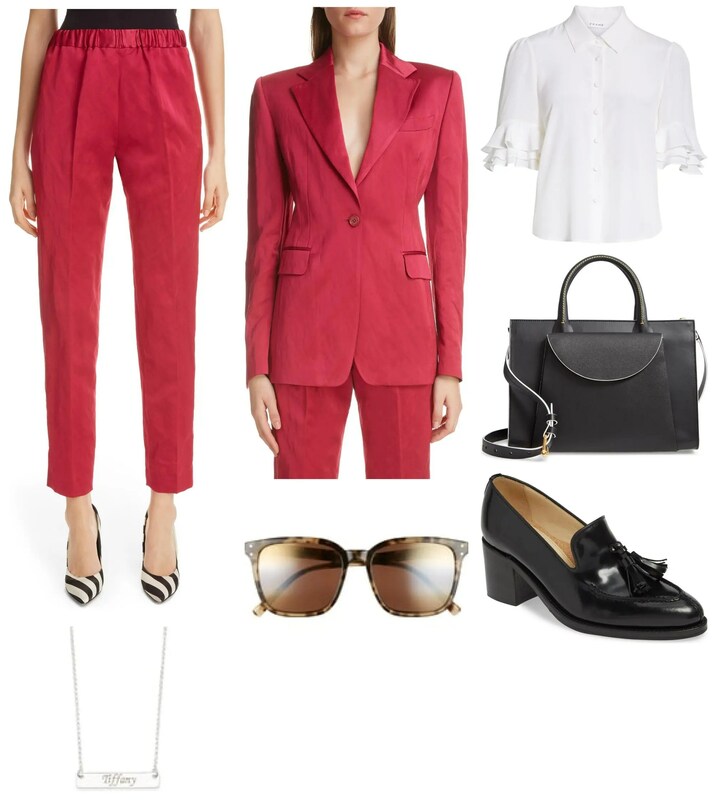 The other new style is the tapered leg (hello 1990’s), this is the great new classic pant style and it looks great with a long jacket to the office. Aritzia has the perfect one, Babaton’s Conen Pant Terado is a style we all know and love, and for Spring it comes in 12 mix and match neutral shades. Dresses in this trend follow the same rules as jumpsuits, KISS, keep it simple sweetie. Shift or Column dresses work great and so do belted shirt style dresses. Think of your classic dress styles and use details like self belts and horned buttons. J. Crew has the perfect Tie-Waist Shirtdress in Cotton poplin. This dress is fab for work or play and will go with anything. If you want a casual dress think Utility, the Oona Utility dress at Anthro is perfect for warm days and vacations too. It also comes in a heathered black if you prefer that. BR is the king of the Column dress in lots of different fabrics and colors, if you want column this is where you find it. Or stick to a Sheath dress but one that fits this trend perfectly. This Double-breasted sleeveless Sheath dress from J. Crew comes in 4 great neutral colors and has both the horned button detail and a tie waist. So we have talked a lot about the pieces that make up the New Neutral trend but how are we going to put it all together? Try a maxi skirt with a tank and tie waist jacket with a block heel for work and for casual switch out the tie waist jacket for denim and add flats. One of my favorite ways to wear the New Neutrals is head to toe, the new red is perfect for every business meeting you have. Keep the accessories simple and then you can pull the suit apart and mix with other neutrals for a change. The above combination outfits are from Nordstrom.com. Here is the way the Conan Pant Terado from Aritzia can be work to work. This look follows the keep it simple rule and you will look fabulous. Wear it with pumps for a more serious look. As I said above a classic trench style coat can work a lot of ways, how about dressy? Here is the Babaton Lawson trench doing double duty and being an evening coat over a dress. Or try some of the ways Instyle Magazine is showing Runway Cargo Chic, just tone it down a bit. So easy to wear beige of khaki head to toe, try your wrap jacket or trench with a softer print pant and wear your high-waisted neutral pant with a crisp white shirt. I could go on and on about Neutrals, they really are the base of my personal wardrobe and work so well for everyone. Check out all the neutrals in new styles online and then hit the stores and add a couple of pieces. Need help decoding the new spring fashions? Keep reading my blogs for more info or email me at SuetheFashionista@gmail.com with your questions. I don’t have anymore spring appointment openings until maybe June and then again not until fall, so if you need an appointment please use the above email and get a hold of me right away. Next week we will look at the Sweet and Girlie trend for Spring, I absolutely adore the accessories in that trend so stay tuned! How to wear black at any age to get you through the rest of winter. Let’s face it, no matter what any groundhog or rodent says we are likely to have winter weather until at least the end of February. And even thought the stores are being flooded with Spring attire, it’s really not an option to wear it unless you live in the South. So for the rest of us, we have to figure out how we are going to muddle through the next month or so in our winter clothes without feeling like they are stale. My motto is when in doubt wear black. Black is a color that pairs with everything, denim on the weekends to neutrals for the work week and even out for the evening. But as you get older you need to either change how you wear black or change how you wear your make up with black, especially if you want to wear black head to toe. In your 40’s it’s time to add a bit of sophistication to your wardrobe. My best advice is to keep your black Casual and Refined. Maybe now is the time to get out of your puffy coat and into a more refined style. 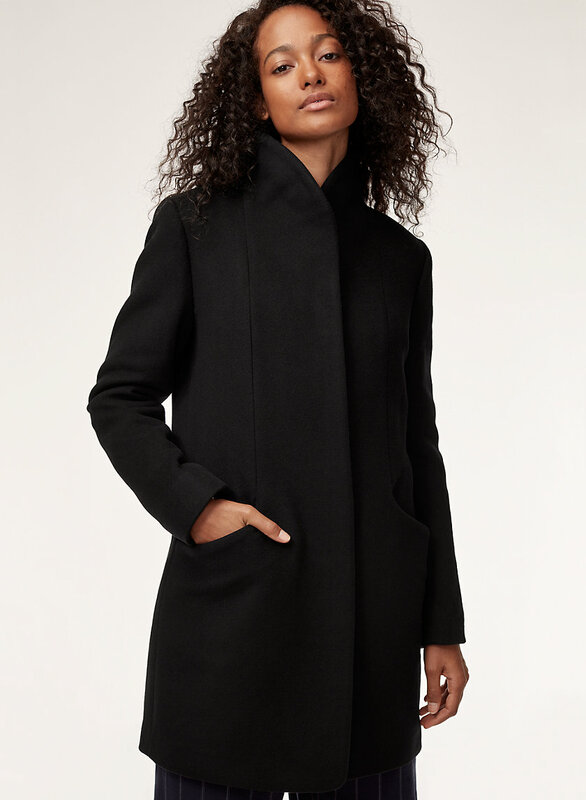 Aritzia’s Babaton Steadman Coat is less than $300 and you will look elegant whenever you put it on. You can wear this coat to the office with a suit, out for dinner with a dress and even on the weekend with your favorite jeans. This picture is from an email I got from Shoptiques.com, one of the best sites for inspiration on putting outfits together. Jen is really looking so refined and classy the way she has put her black coat, scarf and boots together with denim. Take a hint from her and maybe try to add a heel to your everyday boot. You don’t have to do as high a heel as Jen, but you do want some heel. Banana Republic’s Cowboy Ankle Boot has a 2 inch heel and is only $110 on-line right now! Want a knee-high boot to wear with denim Nordstrom has tons of their boots on sale right now, online is better than in store, less picked over. This boot is from Sam Edelman and would look fantastic with skinny jeans tucked in. And the heel is a block 2 inch heel so you can walk all day! Right now you will find lots of black layering pieces everywhere. Wear black sweaters and vests to add a bit more warmth to your coat. Banana Republic is one of my go to’s for sweaters. I live in my washable merino wool Br Sweaters and remember BR always has a sale on. I am in my 50’s and I wear a lot of black. I particularly love days when I get to wear black head to toe. A great streamlined jacket, black knit pants and a black soft blouse, paired with boots or loafers is a great look! A my favorite possession of mine is my Hugo Boss Stretch Wool Suit Jacket. Yes it was pricey, but I bought it 3 years ago and it still looks brand new! It’s ok to invest in a piece like this because by the time you are in your 50’s you are likely not to jump on every trend, every season, and a great tailored jacket looks great with everything. For pants I usually go back to Banana Republic, you can’t beat the price for the quality. These Logan Trouser-Fit Lightweight Wool pant is perfect to wear with your head to toe black look, or wear it more casually like shown in the above picture. For your black blouse, choose a blouse from a company that fits you well. I have been wearing Ann Taylor blouses for the last year. Not super expensive and I find the fit is great. The Ann Taylor Essential shirt comes in lots of colors and it’s polyester so no wrinkling. You can pair your low heeled boot with this look or try a lighter shoe going forward ( yes, in Canada we carry our shoes and wear our boots everywhere). Why not try a pair of block heel slingbacks with a closed toe These are from Vanelli and at Nordstrom.com. Slingback will take you right into spring and beyond, it’s a nice change from pumps. When you put it all together you can rock the look our friend Julia Roberts is wearing. It’s a great refined and elegant look while still having a bit of edge to your outfit! In your 60’s chances are your skin is a bit lighter, as you should be shunning the sun and maybe you are even transitioning to a bit of grey in your hair. Wearing black can be for you too, just punctuate it with Gold, Metallics or even pearls. You can still rock your black coat just maybe wear a metallic scarf with it. Try one of Nordstrom’s shimmer wraps worn as a scarf this is the dusty pink color and it also comes in a gold tone . Both of these shimmery colors will give your face the glow it needs while wearing an all black outfit. You can also add a great necklace to break up your head to toe black. Over a black dress try adding a necklace in a gold or metallic that will help you shine. This Something Navy 2 in 1 disc necklace works over crew neck dresses and high collars like turtlenecks too. Do you love pearls?? Make your pearls the star of the show! This Chan Luu mixed Stone Dagger Pendant necklace will garner everyone’s attention with your head to toe black outfit. Stick to refined styling, and simples lines like clean black pants and it doesn’t get any cleaner lines than BR’s Avery Washable wool pants. Stick to a beautiful blouse like Ann Taylor’s Flare Sleeve top and top it all with a coat that makes you smile every time you put it on. I love Artizia’s Wilfred Cocoon coat, on sale right now and will look great for years. Pair you metallic scarf with it and off you go! Meryl Streep’s amazing head to toe black with a metallic scarf can be everyone’s inspiration! If 50 is the new 30 then 70 must be the new 50. Women are aging better than in any other time in history and that means that they look great at any age and can keep being fashionable throughout their lives. My grandmother reverted to pull on pants and loose blouses and flat shoes by the time she was 60, no way that happens today. So many of my friends mothers look better and better the older they get. Of course it has a lot to do with body maintenance. They go to the gym, get their hair colored and in general have a great time. You can’t tell if they are 55 or 75. So for these women they deserve to have the best. To wear black over 70 you can luxuriate in ladylike details or up the contrast by adding stand out colors and graphic prints. Spend your money and your time in luxurious dresses like this one from Lafayette 148 New York this is their Emory Finesse Crepe dress and you can wear this everywhere! Invest in a stunning pair of Theory Straight leg stretch trousers. They will look as good as they feel. Save the detail for your tops and accessories then pair it with an elegant back coat. This Veronica Beard stretch Silk Top will give you just the pop of color you need while having the high neck so you don’t need a scarf. And if you prefer solids, this See By Chloe Ruffled neck blouse would be perfect with black. And you are never too old for sophisticated animal print! This great Dolce and Gabbana Leopard print top will look great with black and you can even wear it back to your denim! And why not invest in a coat with some detail on the black? This fabulous Burbury Horberie Quilted Trench will love you right back, day or evening. I am in love with this beautiful coat, bag and boots on Helen Mirren. Don’t be afraid to treat yourselves! And absolutely no one rocks 80 better than Jane Fonda. Like I said at the beginning my inspiration for this blog comes from a Website called Shoptiques. They feature one of a kind boutiques all over the world online. Check it out a find your inspiration to rock whatever age you are at! There will be a Valentine’s blog next week and then no blog on Feb 20. The last week of Feb we will talk about what to keep and what to sell or toss for spring and in March we will go right into spring. I am travelling a bit more than I used to so I will try to get everything in before I leave again in May. Oh and by the way, my blogs haven’t been sharing on Facebook and Twitter, I am trying to correct that but Facebook is a bit of a pain. If anyone asks why they can’t find it please direct them to my website Suethefashionista.com. Every one of my friends has a little Boho in them, even me, with my tailored wardrobe, craves a little Boho styling now and then. Every time you put on a maxi dress with runners or flat sandals that is a little Boho coming out. Where do we start, almost every woman I know who has a true Bohemian wardrobe, aside from tons of yoga wear, has a great pair of jeans. These jeans can be the base of any Boho look. So because we talk a lot about jeans and everyone has skinny and straight already in their closet, if you want a more Boho pair try a wide leg and perhaps a cropped wide leg. Banana Republic has a great pair of high-rise wide leg cropped jeans. They also have a pair in a bit of a darker wash if you prefer. Both have a natural hem and both are the perfect Boho style to try in your wardrobe. I am not going to go into too much detail about the wide leg trend. But keep in mind, this new trend is wide right from the top of the thigh to the bottom, get rid of the old jeans were the thighs are skinny but the bottoms flared, those are definitely not in style and don’t wear them instead of the new wide leg. The other clothing item you want on the bottom is a great maxi skirt, or two, or three! Nothing could be more Boho than this Issa Maxi Skirt from Anthropologie. Wear it with a cropped jacket, a t-shirt and runners or just a tank when it’s warm. Wrapped skirts and dresses are very important for spring as well (I just made to many of them in sewing class in high school to ever wear them again!) Try a denim one by Citizens of Humanity at Anthro if you think this is how you will wear a modern boho look. And don’t forget about the knit midi skirt, this one is Bobeau at Nordstrom, I actually have this one in black and I wear it a lot during the summer. In Olive (shown) or black it’s a great addition to a blooming Boho wardrobe. Dresses are also a huge part of the Boho trend. When I go on Anthropologie.com almost every dress will work if you are looking for a Boho feel. When looking for a Boho dress, try to let the dress have a great flow, it shouldn’t in any way be body conscious. Look for layers and tiers, look for bold prints or patterns and look for details like fringing or belting. Think of the hippy look from the mid 1970’s just with a more modern vibe. You could be on the subtle side with Camilla Maxi Dress from Anthro in the Blue motif or go all out in the same dress in the Black motif. Both prints are sides of the Boho trend. Anthro even has a dress called La Boheme Dress, it comes in petite, reg and plus because we are all our own unique shape. Notice the embroidered waist with the dot fabric, so Boho combining the 2 trends. Or try doing something with a classic midi dress that you may already have in your closet like this Rosemary Midi dress from Anthro. Make it super Boho by wearing a white t-shirt under it! They show this idea in the blue color and add Boho accessories too! Boho Tops and Jackets are almost everywhere you look this spring. Of course your denim jacket works over everything boho. But this season maybe try something a little different from your basic denim. Madewell at Nordstrom has some longer denim styles that will look great with wide leg cropped pants or over maxi dresses (just lose the mini skirt). This is the Madewell Chore coat. Or try Madewell the New Denim project Patchwork Cocoon coat. It screams everything Boho and will go with all your Boho bottoms. Suede and leather also work just think of the 70’s hippy trend and use fringe to be your guide. This is the Nili Lotan Suede Fringe jacket at Nordstrom, if you have a fringe jacket in your wardrobe now is the time to wear it. Or try a great Kimono style as a jacket for spring, Anthro has lots to choose from. This one is the Marquess Kimono. Or try a store like the Latest Scoop in Vancouver or Toronto, they always have great kimonos for spring. Tops can be almost anything and everything in our Modern Boho trend. 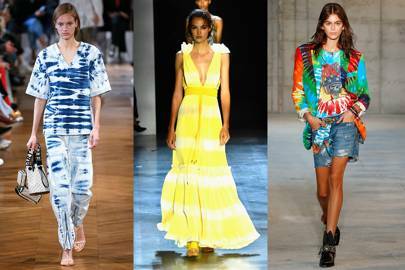 Tie-Dye tops are making a come back and if you feel like wearing then again, then this is the place! Maybe try something like this Karen Kane Split neck top from Nordstrom. But really there are so many other great tops, leave the tie-dye for people who haven’t worn in already in the 1970’s. You could try a great button down top with ruffled flutter sleeves like this one from Anthro, this would look great tucked into high-waist wide leg jeans. Or wear any print peasant top you find and when the weather gets warmer wear this Sleeve-less peasant top from Anthro. It has a lot going on with the print and details and that plays right into this trend. A sleeveless Tunic top would work too with this trend. Wear it with your wide leg bottoms or put a t-shirt underneath to give a true Boho feel, this is the Desmond Tunic top from Anthro and it comes in 4 colors! Or how about a true Peasant top from Anthro. The Sunshine Peasant top comes in 3 shades, yellow, white and green. This top can Boho any bottom. Or just wear a tee with your boho bottoms, just remember nothing too fitted, try something tiered like this Kirby babydoll top from Anthro or loose with a flutter sleeve like Anthro’s Sidonie Top with its flutter sleeve detail. Accessories can change almost any look into a boho one. For shoes think of sandals with a fringe or gladiator look these cross-strap flat sandals from J. Crew would look great with maxi skirts and dresses! 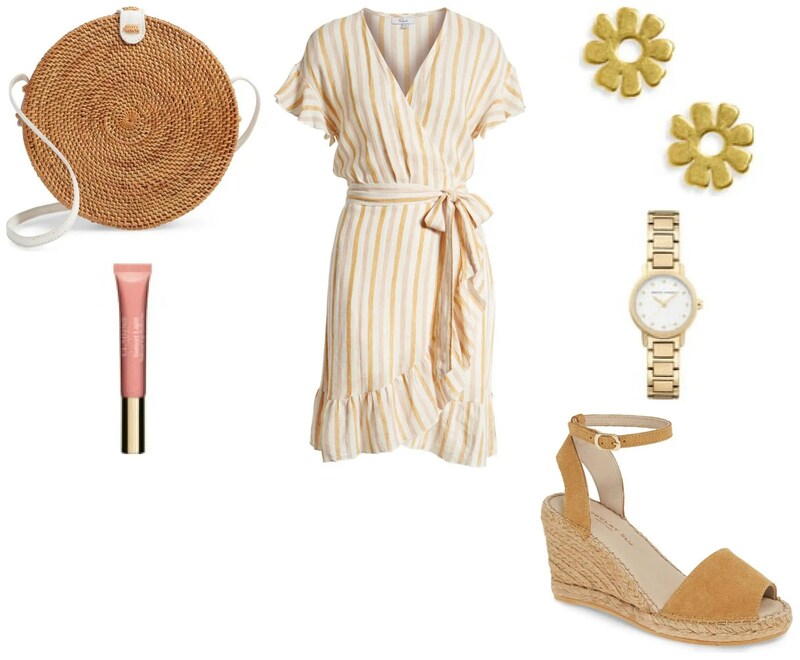 If you want a higher heel, especially with wide leg cropped pants then look for something with leather and espadrille details like this Sam Espadrille Wedge Sandals from Nordstrom. Even a basic woven slide can work with your Boho styles like this one from Madewell at Nordstrom. Bags are were you see detail too. Macrame and Woven straw and fabric totes and bags are so Boho and fit with everything Boho you will wear. Or try a wood top handle bag. Both these bags are at Anthropologie. You can even wear any slouchy bag you have from the past we all have a style like this Frye leather hobo bag, maybe not this color but it would certainly work. Scarves, Wraps and Kimonos can play a huge roll in this trend. Remember when I said accessories can make your look Boho, here is where you can do that. Try a beautiful patchwork from Anthro, the Dylan Floral Cocoon Kimono can work with any bottom to make your look more Boho. Or use a striped cotton scarf to elevate your white tee and denim. This is also from Anthro. Or take a small floral scarf (we all have them) and wrap it any way you want around your neck instead of wearing a necklace. You could even wear it around your ponytail to achieve a Boho look. One last accessory look that can make your look more Boho is an open weave cardigan or kimono like this one from Anthro. For Jewellery keep it really boho with big hoop earrings (leave the feather earrings for your daughter) and bangles on your wrists and long multi layered necklaces. You can even go with a wood pendant, I have seen them all over, this one is from Anthro. Jewellery can embrace the Beachy Chic vibe, try this Santa Cuz beaded Bib necklace with your Boho look. Put this over any top with wide leg jeans and you have Boho written all over you! For earrings you can try hoops with detail, like these from Anthro. Or go for a pair of wooden hoop earrings these ones from Anthro really have a boho vibe. You can bangle or mix and match your bracelets a la this look from Anthro. Or maybe try a Wicker Bangle set also from Anthro. Or simply make your Boho statement with one big bangle like this Striped wooden bangle from Anthro. Remember whatever you wear on your wrist the key to making it Boho will be texture. All the bracelet looks have texture. You can use the pictures of each look above to see what earrings, bracelets and accessories the websites have paired with the clothing. That’s a great place to get accessory ideas for an outfit. Or go to Nordstrom.com and look through the looks their stylist have put together. I found 3 different looks that all work with our Modern Boho look. Use these as a guide too. I know this blog was a little longer, but the Modern Boho is one of the biggest spring trends and as I said at the top, every woman has a little Boho in them. Next week we will cover the last spring trend, Bright Colors. After that there will be a spring occasion blog and then no blogs after May 1st until June. So get all your style questions to me in the next 2 weeks or you will have to wait until June. Email me at Suethefashionista@gmail.com to ask me any fashion related questions you have. Now when most of us think Sweet and Girlie we think of our daughters and nieces, but this trend is so much more than floral mini dresses. Save the mini dresses for the young women in your lives and if you like feminine details this trend can be for you! 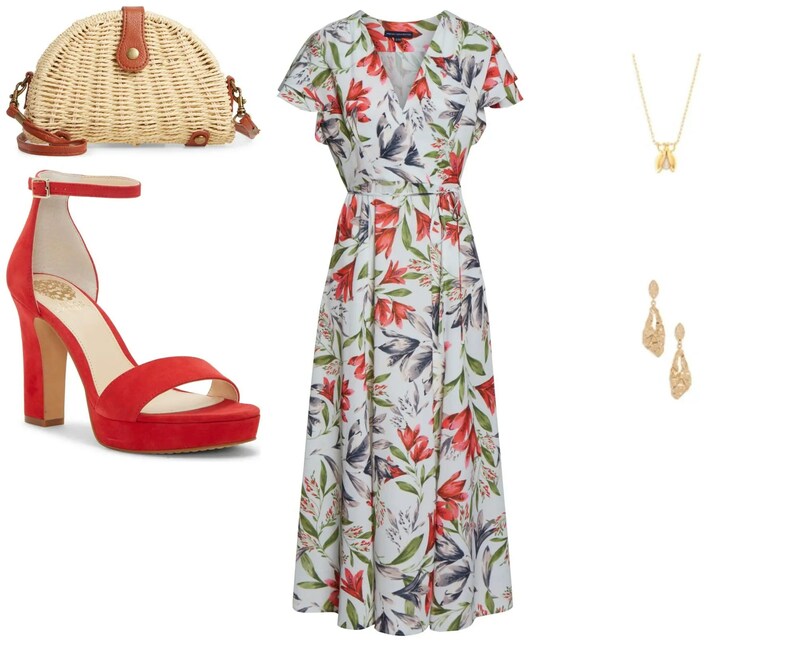 About 10 years ago I went through a floral dress phase, I bought about 5 of them and wore them constantly with kitten heeled sandals, I think that’s when the latest version of the movie Stepford Wives came out and I fell for the clothing in that movie. And that is exactly what this trend reminded me of when I started to do my research. But really it is so much more, this trend is much more about the cut and feel of the clothes as it is about the detail. The accessories and shoes you wear play a huge roll in it too. And if you keep your shoes and accessories solid colors the accessories that work here can work for other trends as well. So the first place we will start with this trend is Dresses. What makes a dress girlie? Well we already talked about florals, a floral dress definitely works in this trend. But we are seeing other details like ruching, pretty collars, and of course bows. All these, plus sticking to feminine colors can make almost any dress work in this trend. I am going to start with a fairly simple dress . This is the Lincoln Center dress from Anthropologie, it also comes in black. But it is way more feminine in the Rose color. It’s a simple empire waist bodice that will look good on anyone in any size. This color of pink is pretty universal and it really will make you feel pretty. A more obvious dress is this Amelia dress also from Anthro. The bold yet feminine floral is great, this dress could do double duty in your wardrobe as a day dress and occasion dress depending on the heel and accessories. And sometimes it is the details of the dress, not only the color or fabric that make it feminine. This is the Gradeur dress from Anthro, it comes in Plus sizes as well (as do a lot of Anthro’s dresses) because we are not all a size 0. Notice the sleeves, the ruffle hem and the square neck. They all combine to make this dress feminine. Or you could go all out Girlie like the runway styles suggest. Ted Baker has the quintessential Girlie dress in his Spring collection and you can find it at Nordstrom Rack. Jumpsuits can also play into feminine dressing. Gingham is a huge trend again for this Spring, so why not make that one of your feminine tools when dressing J. Crew’s high neck jumpsuit in gingham sky ivory can take you almost anywhere and you will look pretty. Wear a solid metallic sandal for an evening event and cute flats for daytime and you are set. One more style I want to talk about before I move on. You will see a lot of Ruching on tops and dresses, if the dress or top fits you well, this ruching can create the illusion of a smaller waist or a more defined waist. This is the Leith Ruched Tank dress at Nordstrom, it comes in 8 colors and you can wear it almost anywhere. Put this look together with casual heels or wedges for daytime and heels for evening. 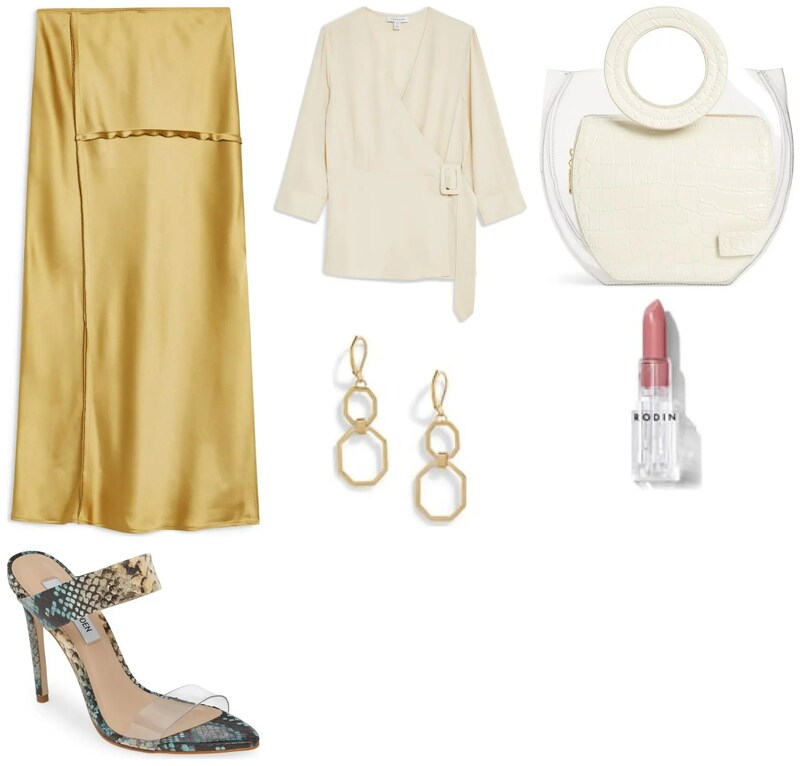 Make it more feminine with earrings and a dressy bag. I am going to end the dress section with showing a Kate Spade dresses, the designers of Kate Spade know how to truly embody Girlie and Femininity in their styling. This floral midi dress has a defined waist and look at the neck ruffle detail. It is sophisticated yet girlie. Feminine and Girlie tops are easy to find and a great way to get this look with either pants or skirts. An off the shoulder top is a great way to wear a more feminine look especially if it’s a cotton top like this one from Elodie at Anthro and you can throw it on with jeans or skirts. We all have off the shoulder from last year or the year before, so that is one easy way to embrace this trend. Or if you have good arms, try something sleeveless like this glittery Ciana high neck top from Anthro. This type of top works great with wide leg cropped pants and denim and will feminize all your outfits. And here is a quintessential Girlie top that I have seen in magazines and on this trend everywhere This is the Cece Pleat Sleeve Collared Crepe blouse from Nordstrom, it is a copy of the Karl Lagerfeld Paris top and it really is perfect for this trend. The feminine sleeve and collar work to make a pencil skirt for work more feminine and wear this top with patterned pants or denim and delicate shoes to make a statement. Of course all your floral tops work with this trend too, something as simple as this Boswell Blouse from Anthro can feminize almost any outfit. The sleeve detail is also on trend, remember puffed sleeves are super trendy this spring. Accessories and shoes play a huge roll in this trend. With shoes think retro to modern, block heels and square or pointy toes. These Jeffrey Campbell Jewel Square toed slingback shoes will work perfectly here. As does this Geox Vivyanne Square toed Loafer. Both shoes can be found at Nordstrom online. If you want to do more of a sandal try strappy low heeled sandals in a feminine color from J. Crew. Block heels are very trendy in high and low heels for spring and they really work with this trend. Bags can make a simple black dress look more feminine. Try either one with feminine details like a bow, or a feminine print or a great color. Try a pretty pink shoulder bag with a feminine clasp. Or if you prefer a satchel try an embellished one in a soft color. Or try a straw bag, this is the one bag purchase I am thinking of this spring, and it can look super feminine with this trend. All the above bags are from Nordstrom and are Kate Spade New York. And of course there are bow bags, this one is Ted Baker and you can find bow bags everywhere from every designer. Keep your accessories feminine, pretty earrings, bracelets and necklaces. Let your collar and your print dictate what you wear with it. Pretty and feminine accessories are everywhere. A rose quartz and pearl bracelet set can feminize any top, these can be found at Whitehouse Blackmarket. J. Crew has beautiful statement floral necklaces if that’s what you need. Pearl earrings work really well as do pearl necklaces with this Sweet and Girlie trend, or perhaps try a more modern take on the simple pearl earring from Anthro. They key to this trend is how you can put the look together. If you have a lot of black pieces in your wardrobe think about pairing them with the pale roses and blues of spring. A soft pink top looks great with black on the bottom. Or take a simple dress with a bit of detailing and make it more feminine by adding a shoe and bag that accentuate femininity. Curate your own style with a floral dress for an occasion. And last but not least let the dress speak for you by being the star of the outfit. The above outfits were all curated by Nordstrom stylists. The look of this trend is about feeling the sweet and femininity of it just as much as wearing the clothing. Pink lipstick can work here to make you look more feminine. You can play with your hair and make up to make any outfit more feminine. Talk to your hairdresser or a make up artist if you are ready to do this. I hope you feel better informed about this trend after reading the above. Next week we will look at the Modern Bohemian, which actually takes a little out of this trend but goes in a completely new direction. I have a lot of Boho friends, so that next blog is for them. If you have style questions or want to set up a summer time appointment email me at Suethefashionista@gmail.com. Summertime is a great time to get your fall wardrobe in shape so as soon as the weather turns you are ready. So book me early as I get quite booked up for fall appointments. Let’s Go Retro, the 90’s Mixture for Spring! Every few years what was in style decades ago comes back in style. Although those of us who lived the 1990’s probably never thought we would be talking about acid wash jeans or big oversize blazers again. But here they are. My mother used to always say that if you are old enough to remember a trend you are too old to wear it when it comes in again, and that is partly true with this trend for those of us over 50. You may not want to jump right back into acid wash and suspenders but there is a way you can achieve the look without wearing what the 20 year old women are wearing. Let’s start with something easy that you can find almost anywhere and that is graphics. Remember how something written on your shirt or sweater was so cool, well you could do that again. J. Crew has you covered with Sweatshirts and T-shirts that all say something to make you proud to wear them. Do them in a basic color or let the color you choose be part of the statement you are making. I love the mixing of pinks and reds and this sweatshirt has that. Or try a t-shirt that tells the world who you are . Graphics with statements about the power of women are very popular and we all know that women are powerful, so let everyone know how powerful you are and all your gal pals too! Banana Republic created an online shop for International Women’s day with their Equality Collection, all the t-shirts, bags etc. have empowering statements. So graphics are an easy way to bring a little 90’s back into your wardrobe. Another great way is wear an oversize blazer. Remember the show Saved By the Bell, yes that kind of oversized blazer. 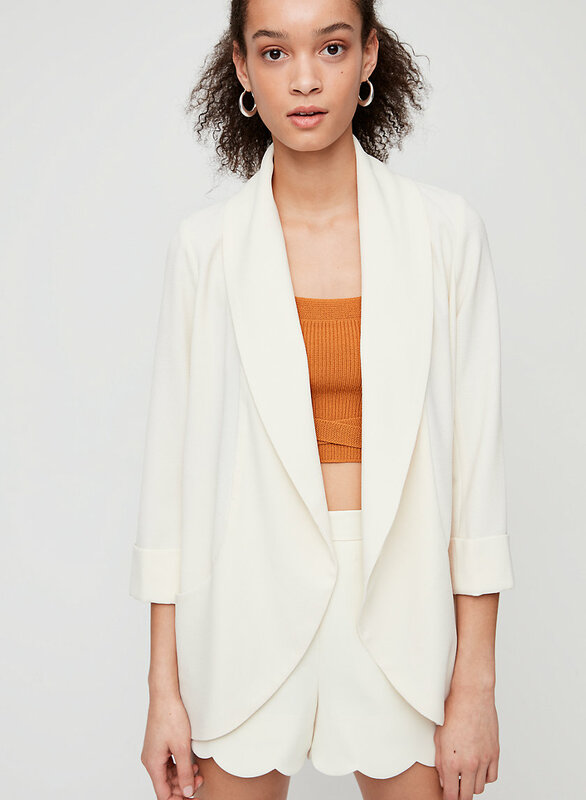 One of the best go to places to get a great Blazer of Jacket that is on trend is Aritzia. 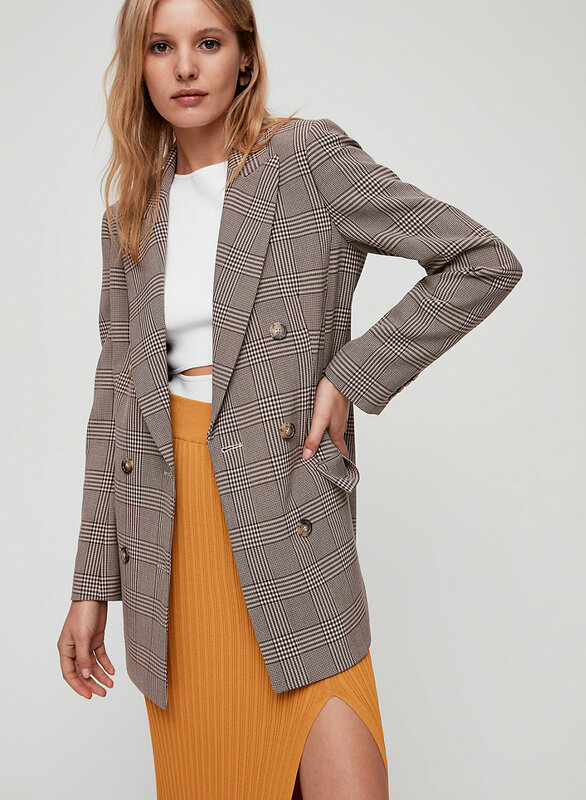 This Margaux Blazer by Wilfred is the perfect silhouette to take you back a few decades. Wear it to the office or on the weekend with a white shirt (collar up) and jeans. Remember how we used to roll up the sleeves on our blazers as well, try the Chevalier blazer from Wilfred, it comes in 5 colors and will work with a number of different looks. If an oversize blazer isn’t your thing, then maybe try to emulate that look with an oversize shirt with strong shoulders. This Adam Lippes Jaguar print silk shirt can be just that. Animal prints, specifically leopard and snake-skin are making a huge imprint in this trend. A stong print blouse with shoulders that echo the 90’s can do the same thing as a blazer for this trend. As a matter of fact any heavy top over a simpler bottom can do it. There are lots of choices in bottoms and we will go into that shortly. For other tops that can echo the 1990’s look for tops that come in at the waist (remember peplum tops) J. Crew has the perfect style in a polka dot print. Polka dots were huge in the 90’s, I wore polka dot print shorts on one of my first dates with my husband. When you wear you polka dots think of the way you used to wear them. Peplum tops, fitted shirts, full skirts, etc. And what did we wear over top if it wasn’t a blazer? I wore an oversized denim jacket like this one from Madewell at Nordstrom. Just remember to keep you top layer oversize and you will hit this trend. For bottoms we wore a lot of pants in the 90’s, longer skirts were also in style. If you want to relive your glory days but put a modern spin on your bottoms perhaps try this Kiwi Midi Skirt from AFRM at Nordstrom. They paired this skirt with a simple solid color top and these shoes by Vince Camuto with its block heel. Wear this with an oversize black blazer or a denim jacket and you are perfectly retro. Speaking of snake-skin and leopard print you can add it in a lot of ways to tops and bottoms in this trend. Banana Republic has a whole section on their website dedicated to animal print. Try a high-rise wide leg pant in snake-skin or a cropped wide leg jumpsuit in leopard . Pair them both with oversize blazers or denim jackets and you can be retro and modern at the same time. Wide leg pants are very strong for spring, especially in denim these ones are by Madewell at Nordstrom. Or in twill pants like these from J. Crew. If you wear these silhouettes with the oversize and fitted waist blazers and tops you will get a modern feel to the retro top. But the other big bottom in this trend is the tapered leg, which is the pant style we wore in the 90’s. Here is Eileen Fisher’s version of the tapered leg jean. If you really want to wear them again then go ahead. But perhaps stay away from the acid wash ones. If you go for a lighter wash like the ones above great but save the acid wash for your daughter and same with denim jackets. I know you will see it in magazines but really we can just do a light wash denim and get the effect without looking like we are trying to be something we are not. Hats are a big trend for spring too. We talked about oversize hats, but you can do the 90’s fedora style if that is something you want. To take this trend a little more modern, try one of the new oversize style of hats. You can even oversize your fedora a bit. Or oversize your floppy hat for a modern take. You can even oversize your bucket hat this spring! All the above hats you can find at Nordstrom.com. And if you want to retro you handbag, don’t wear a handbag at all, go for a fanny pack. They now call them belt bags and Artizia has lots. This is their leather zip belt bag and it comes in red and black. So you can 90’s up your look as much or as little as you want. One great way to do it is to tuck a cardigan sweater into your boyfriend jeans, which are two things we all own. Wear it with loafers and a big belt and voila, you are right out of the 90’s again. This trend tends to be a little tricky as you age. But pick one element, like the animal print or the oversize blazer or the belt bag and let that be your nod to it. Next week we will cover the New Neutrals and our Cargo Chic on. Ruffles and Glitz for Spring 2019! The first spring trend we are going to look at with more depth is the Ruffles and Glitz trend. Ruffles have been in style for a while now, with this trend we are seeing it amplified for spring and added to a few other newer trends like puffy sleeves, pleats and sequins and bling. Two weeks ago I posted a picture of what they are calling ‘Crazy Couture’ where all sorts of things are going on in each outfit, but that is the run way and not the real way. This blog will look at the real way to add a bit of this trend into your spring wardrobe. One of the easiest ways to add this trend into your wardrobe is with a top or dress that has ruffles. One of the websites that sends me an email everyday is a site called Haute Look, it is a Nordstrom site that has discounted clothing but only for a limited amount of time. Every once in a while you can find something unbelievable for a great price. This week they featured a line called Gracia, which is famous for having clothing with lots of details. But this image from them, with their wide Dolman Sleeve crop blouse in bright mustard paired with high waist pants illustrates what this trend is about. That top could also look great with wide leg cropped jeans. It’s the kind of ‘Crazy Couture’ you could actually get some wear out of. Or you can step out of your comfort zone just slightly and do a softer more feminine ruffle shirt from Anthropologie. The Layna Ruffled button down shirt comes in this beautiful lavender or black and would look good on everyone and totally be perfect to reflect this trend. If you are like me and want to wear your ruffles for daytime there are lots and lots of options. You could wear your ruffles in a t-shirt like this Corchallan Top from Anthro, it comes in this stunning Maize yellow and black. Or choose a t-shirt where the ruffle is just in the sleeve like this Chelsea Ruffled Tee from Anthro . Both of these t-shirts are great weekend and casual looks that give you a hint of this trend. Or if you want something you could wear for work or play try a top like this Andover Ruffled top from Anthro, this top is great with denim and under a v-neck or collarless jacket as well! You can do a dress to that hits the ruffled trend , Banana Republic has lots of dresses like this soft Ponte wrap dress that has just a hint of ruffle. 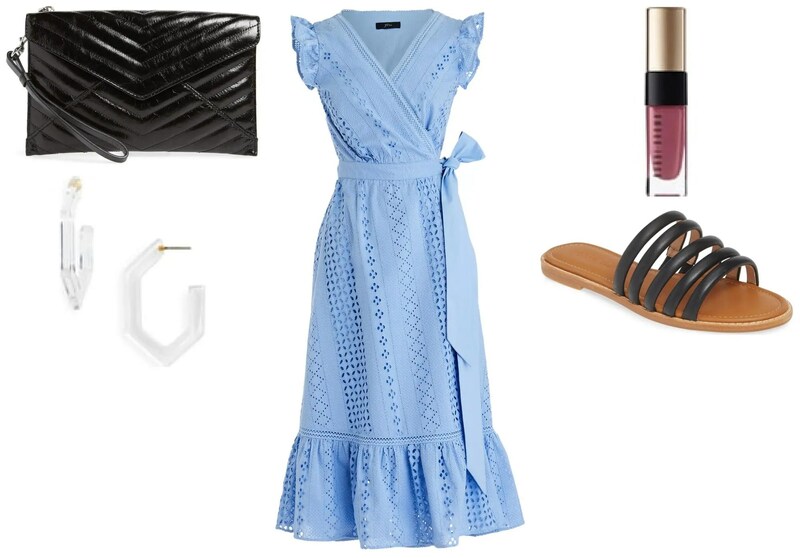 Maxi and Midi dresses are as big as ever for spring why not try adding a bit of ruffle to a maxi dress? BR has tons of Maxis online and they all have ruffle detail. You could even add ruffle to your spring jumpsuit. Check out Banana Republic online, a lot of their spring dresses are on sale already. You don’t have let this trend be just in your tops and dresses. Pants and skirts are also getting into this trend. Last year we saw a lot of pleated midi and maxi skirts, those work perfectly here, if you have one from last year especially if it looks like this one from BR pull it out again and wear it. Or if you don’t maybe get a skirt that has some shine to it BR has skirts like that as well. If you are comfortable with a shorter skirt (not mid-thigh but just above your knee) then maybe think of doing a skirt with a sheen in a pencil style. This Shiny Leopard print skirt from Gracia hits on another big trend for spring, yes leopard print seems to be here to stay and we will talk about that more in upcoming blogs. Or try a skirt that is as office friendly as it is trendy and wear something like this Flounced Menswear skirt from Anthro. There are pants with ruffles out there for spring too. But I think most of us prefer to wear a simpler bottom with a more detailed top. But I do own a pair of ruffled pants that I wear for dressier occasions. I have a pair similar to this Alice+Olivia pair from Nordstrom, they are great if you want to wear dressy pants. If you want pants you could wear to a creative office or daytime try a pair like these from 1.STATE at Nordstrom. The color is subtle enough that you can wear this pant day or night. But my favorite pants to work with this trend are pants that are stylish but let the rest of the outfit shine. 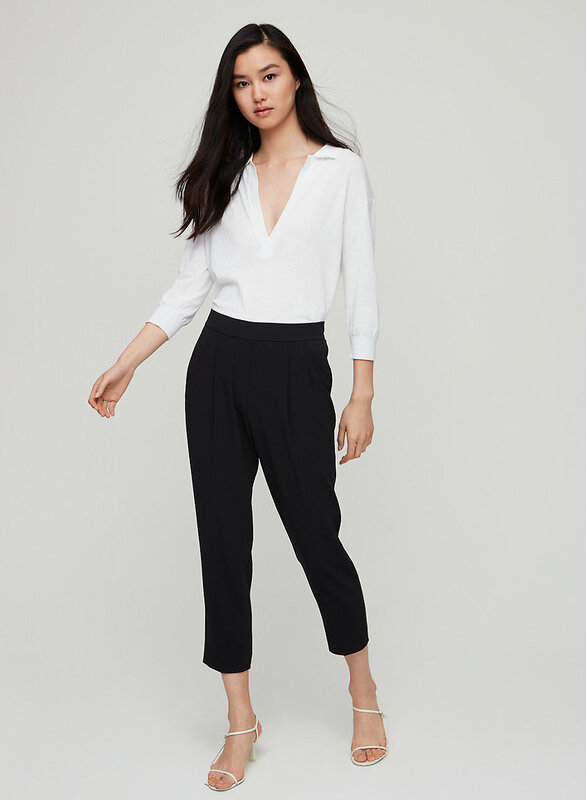 Try cropped wide leg pants like these soft high-waisted pants from Eileen Fisher or try a straight leg pant from BR like the Ryan or Avery fit in a color that works with your tops and let the tops be the star. Now we haven’t done much Glitz yet, we have been focussing on the Ruffles. There are more Ruffle styles than Glitz styles in the real way but they showed a lot of Glitz on runways. You can incorporate Glitz in a number of ways. We saw above that you could add a skirt with Glitz or shine, you could also add subtle shine to your maxi dress like this soft satin Maxi dress from BR, which also comes in a blush pink color. You could do your Glitz in fabrics that have shine to them like the maxi dress or these silk pants from J. Crew . Or you could use your accessories to tell your Glitz story. One of the easiest ways to add bling to your outfit is to wear a glitzy bracelet like this pearl and crystal bracelet from J. Crew. A little bling on your wrist can go a long way. The same goes for a sparkly necklace, this one is also from J. Crew and would be fabulous with wide leg pants and a round neck simple shirt. If you are going to do glitzy accessories let that be the focus of your outfit. A substantial earring with Glitz or Bling can accomplish the same thing. Other accessories can be your glitz focal point as well. Don’t forget how a detailed handbag can make an outfit. It can be as subtle as just a little shine on your purse or go all out with bling . Both these bags are from Nordstrom online and they both make a statement. You could also hit the Ruffle and Glitz trend with your footwear. There are lots of shoes for spring that have both ruffles and glitz. J. Crew has a great pair of pointed toe metallic slides in Jacquard that would be perfect for this trend. Or do a pair of shiny pointed toe flats, also from J. Crew and they would look great with cropped or cropped wide leg pants. Snake skin print is huge for spring and these sling backs from J. Crew are not only snake-skin but have a bit of shine to them as well. And last but not least a great pair of block heel metallic sandals will absolutely compliment any spring outfit you are wearing. All the above shoes can be found online at J. Crew. So you don’t have to go all in on this trend from head to toe, as a matter of fact, I think it is more effective to choose one piece and let it stand out. Wear a Ruffled top with simple pants or shiny shoes with wide leg crops and you will hit on the RuFFle and Glitz trend without it becoming overwhelming. Next week we will look at the 90’s Mixture trend and talk more about snake-skin then. In the meantime feel free to email me your fashion questions at Suethefashionista@gmail.com I am always happy to answer them. Last week we covered the first 3 of the major trends for Spring. I try to do my research and then break the fashion into understandable categories that you can keep in mind when planning your wardrobe. For instance, right now there is a flood of fashion in the stores and this way you can have an idea of what you are looking for and maybe where to find it. I hope you all find this helpful. Anyway on with the rest of the Spring 2019 trends. When you hear Sweet and Girlie what do you think of? I think of bows and lace and pretty dresses, skirts and tops. And that is pretty much what this trend is for spring. Mini skirts are making a come back for spring, but that doesn’t mean you have to wear them if they don’t look good on you (and let’s face it most women over 50 shouldn’t be wearing skirts that are super short, just above your knee is fine, but mid-thigh? Who are you trying to fool?). How do you get around wearing a mini with this trend? Well try a pencil or full skirt that hits you at the knee, it will still work. You can always try a wrap dress as well, that shows a bit of leg as you walk. This Wrap dress by Halogen at Nordstrom comes in some great spring colors and has movement when you walk, it has a great bow detail at the waist as well. Lace is a huge part of this trend as well, don’t pick black but pick one of the new strong spring colors (brights or pastels)or white to make a statement. This dress is by Sam Edelman at Nordstrom and has a peek a boo hem so you can see a bit more leg if that’s what you want. Jumpsuits are super strong again for Spring and you can wear them in any trend depending on the jumpsuit you choose. Floral prints are huge in this trend why not try a floral print jumpsuit? No one has more florals for Spring than Anthropologie, between their dresses and jumpsuits, if you love florals they have it. 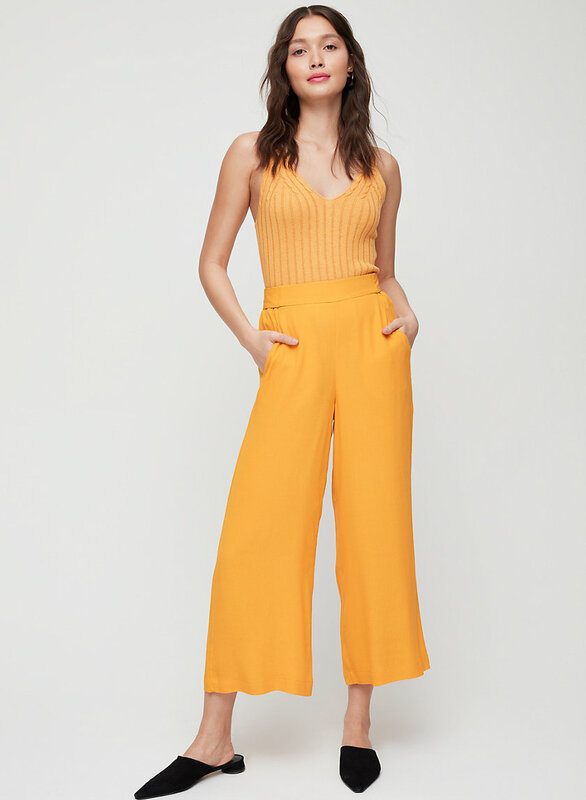 Cropped Wider pants are a must for spring and this jumpsuit from Maeve at Anthro online has you covered for your Sweet and Girlie trend. Tailoring is also important in this trend, so look for pieces that have a very feminine tailoring and maybe some feminine detail too. Aritzia has lots of perfect feminine tailoring this Wilfred Carine Dress is perfect for Spring. Even sweaters for spring can have feminine tailoring Ted Baker has a fitted sweater in perfect lavender with a floral lace collar, perfect. When choosing a sweater or jacket with this trend try and think what makes it feminine, sometimes it’s a bow, or lace or ruffled tailoring, choose what looks best for your look. I love feminine styling and here is a great trick to achieve this look without spending a ton. Grab one of your short cardigans like this cute little stretch cotton cardigan from Banana Republic in Blush pink and just put something frilly or a scarf with a big bow at the neck. You can go tone on tone with this reversible skinny scarf also from BR or try to take it up and mix colors and prints by doing an off-color scarf with the blush sweater . It’s a little more fashion forward but perfect for spring. Last thing I want to talk about with this trend is shoes. When you think shoes for this trend think back to a retro look, square toes and low heels. Here is a great Cole Haan shoe at Nordstrom with all the right details, slightly squared toe, block heel and a feminine embellishment. Or try a rounded toe sling back in one of the new spring colors. Just remember to keep the details feminine. Boho never really goes away, it just keeps reinventing itself to match what is in style for any particular season and this spring is no different. This spring there are things that any proud Boho would love. There is a trend called Beach chic. It includes light and airy blouses like from Sea at Nordstrom. And easy breezy Spring dresses like this Reformation Locklin dress also at Nordstrom. Here is where you will find your jogger pants these are Caslon at Nordstrom but everyone has them for spring. Here is also where you will see a lot of wide leg cropped pants and denim. Anthro has you covered for wide leg Chinos, just pick a fairly soft washed out color with this trend and wear it with your flowy tops tucked in or shorter tops. 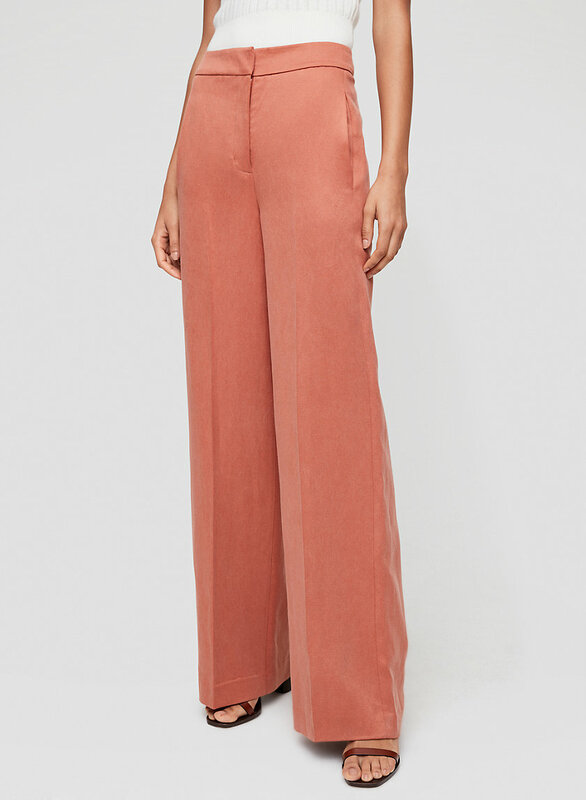 Anthro also has a great selection of wide leg cropped jeans and here they have put their Pilcro high-rise cropped flares in a perfect Boho look for you. Anthropologie is one of my favorite places to explore the new Modern Bohemian look for spring they have great tops, dresses and bottoms for this trend. Grab a top like this Begonia Blouse and wear it with your wide leg jeans or pants and you are perfectly Boho. Boho looking shoes haven’t changed much since last year, your espadrilles and gladiators still work or try a t-strap woven sandal if you want something new. Accessories are huge in this trend too, wooden jewellery and straw bags. We will cover everything when we do this trend in-depth in the coming weeks. Spring 2019 is nothing if it’s not colorful. So don’t be shy, try one of the newest colors or grab an old favorite. Why not try a sweater you can wear now and later with some great colors for spring, this is BR’s fitted cotton crew sweater. BR’s basic washable merino wool sweater come in all the new spring colors this is berry pink but it also comes in a reddish-orange, green flash and berry jam purple. Try which color you like best, I love the reddish orange. Try bright-colored bottoms too I just love this BR Avery pant in Red and Royal Blue. Brights are huge for spring. Even try a bright jumpsuit if that tickles your fancy. This is the Little Moon Lavender Jumpsuit from Aritzia, it covers a lot of the spring trends, bright-colored, wide leg and cropped. If you prefer not to wear things that are too bright in your clothing than cover that off in either your shoes or accessories. Colorful slides can work all the time, this one is Linea Paolo form Nordstrom. Or grab a brightly colored handbag This Tory Burch mini leather bag will accent you perfectly colorwise for Spring 2019. 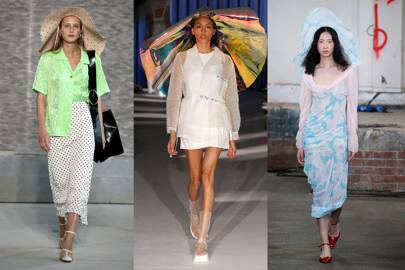 So there we have the 6 fairly major trends for Spring 2019. For the rest of March and April I will go through each trend in-depth and do blogs about Spring Occasion dressing and Spring accessories. We will start next week with taking an in-depth look at the Ruffles and Glitz trend. Welcome to Spring 2019! Yes, I know it still feels like winter in most places right now, but truly spring is just around the corner. 2 weeks ago I told you what to hang onto that you will probably wear again this spring. 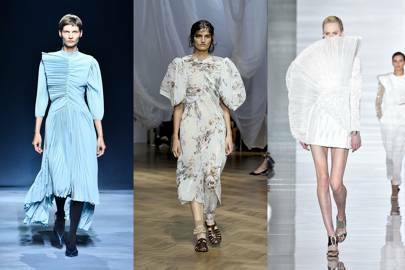 In this blog, I am going to go through the first half of the spring trends and then next week I will follow-up with the final 3. Then in the following months cover each trend in-depth. Since we are all women who have experienced life a bit I will say a couple of things before we get started, there is a lot of throwback in Spring 2019 to the early 1990’s and no one over the age of 40 should wear white boots or booties. There are a couple of spring trends for women who don’t remember the early 90’s, like white boots and mini skirts, really and truly unless you have the body and confidence to pull it off, stay away from those two trends. Now that I have finished my preaching let’s get started! Remember we said the early 1990’s so think of all the ruffles and glitz that were those days. I think that’s when the term Bling first started. In this trend we are going to see things like Crazy Couture (pieces and prints put together like never before). Think of things like polka dots with florals, light and heavy fabrics, etc. This great image from Elle UK. We are going to see a lot of oversized sleeves and puffy shoulders. In Anthropologie’s newest Spring collection you will see a lot of tops with sleeves like this Barnette Puff-Sleeved Top. There are short and long ones. Even fairly conservative stores like Banana Republic have puff sleeve tops . They will not be hard to find. Check out this Tibi Shirred neck top I found at Nordstrom, it has a lot of what this trend is about, a little ruffling at the neck and super puffy sleeves. Something else in this trend is oversized hats. As we get further into spring we will start seeing more hats and the bigger the better is this Spring’s trend. Even bucket hats are getting the oversize treatment, this hat is from Anthro. This image is from the Glamour UK web page, so you can see how oversize the designers are showing, for real way instead of runway, take it down a notch but still wear your spring hats big. Pleating is big for spring. Tight pleating was on runways. Again from Glamour UK you can see all the pleating and pleating and ruffling on runways. For us we can take this down a notch as well, look for softer ruffling and pleating like this BR Poet Sleeve blouse. And keep wearing your pleated skirts. 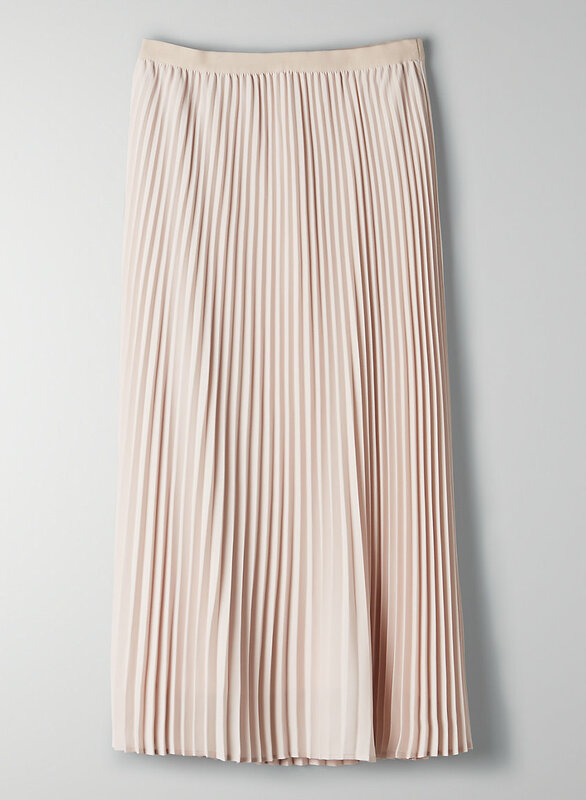 A lot of us bought a pleated skirt last spring like this great style from Aritzia this is the Jude Skirt by Babaton. I have this skirt in black, but maybe this is the season to try it in a new color like this soft pink or marigold, or even a floral. You decide, this Babaton skirt looks good on everyone. Another trend we saw on runways was the tuxedo trend, and for Spring 2019 we are seeing it take on a new direction. This Quincy Shawl Blazer is from Equipment at Nordstrom, this is the type of tuxedo look we are seeing for Spring. By far one of the biggest trends for Spring 2019 is the early 90’s influence on fashion. Starting with acid wash denim, not tailored like it was in 1990, but with today’s influence. Waists are higher in pants and skirts for spring and wide leg crops are huge. These are J Brand and they are from Nordstrom. Graphic tops, in bold bright shades are going to be something you will want to wear. A great example is this t-shirt from J. Crew and even though it doesn’t fit into this trend, gingham is still strong too. When you are buying dresses and tops look for things that are a bit of 90’s mixtures, like paint strokes with pastels. J. Crew has this brush stroke floral print in tops and jumpsuits that really hit on this trend. Prints from the 90’s are back as well, take a look at the snake-skin print pleated skirt you can find at BR for Spring . There is a lot of snake-skin coming in especially in accessories, you can do a great little sandal with embellishment from Steve Madden if you prefer accessories to clothing for this trend (I do). Or do something like this Tory Burch clutch which really hits the 90’s trend. The other big print is tie dye, remember how much tie dye we used to wear, well now it’s gone designer. 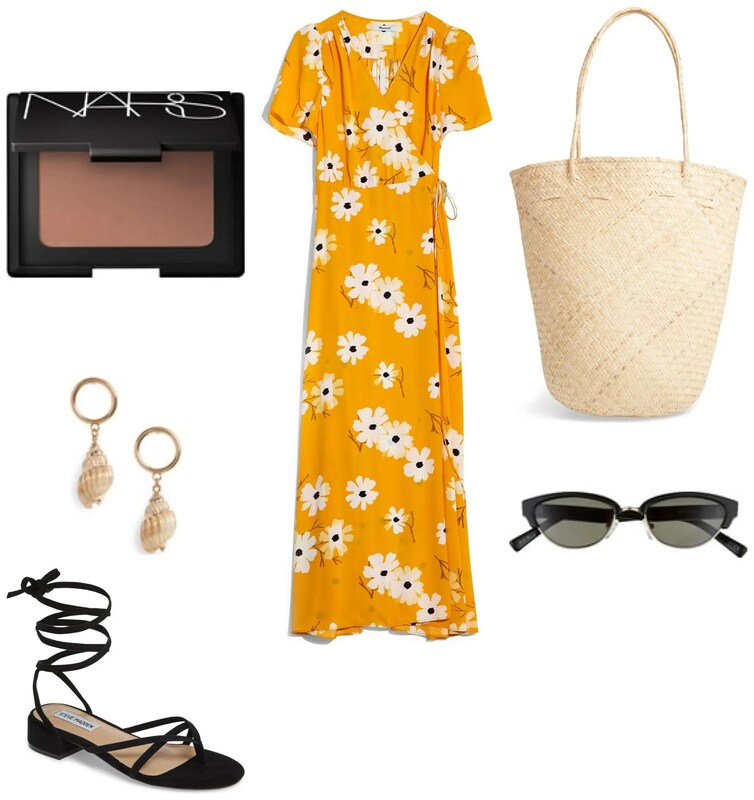 Glamour UK is showing it a la runway, for us this Karen Kane tie dye shirt dress from Nordstrom is something we could wear to hit this trend. I am a sucker for Neutral colored clothing, living in Vancouver you can wear neutral colored clothing almost all year round. What are the New Neutrals? Well they are neutral colored clothing modernized for this Spring. Elle UK shows us what this means. For real way you could almost call this trend Cargo Chic. Which means take your basic chinos up a notch. Wear your basic Chino colors but with a higher waist detail like these pants from Anthro and while you are at it, wear a top with a ruffle like in this picture. Joggers are very much still important and this is the trend where you will place them Anthro has 2 great pair, yes black is considered a neutral and so is denim. Another silhouette I really like for spring is the wide leg crop pant, and the best way to experiment with this style is to wear it in a neutral shade. Utility jackets are huge for spring, this one is from BR, dress it up and wear it to work or casually on the weekends. And hang on to your neutral colored trench coat, you will wear it again this spring . You can do it basic like this one from BR, or try something to take neutral up a notch, I love this polka dot chambray trench from BR, polka dots are huge for spring and denim is super neutral. Think how great this will look over your solid pants, skirts and dresses. Even dresses are going Utility, this great little dress that you can layer a t-shirt under or wear as is from Anthro also comes in Black. Both ways are fantastic to really hit this trend for spring. You could add soft pink and red into this trend as well, as long as the style is cargo chic and the color is fairly neutral (meaning you can wear it head to toe or with other colors). But we will go into more detail about this trend and all the other trends in the coming weeks. So there you have it, the first 3 major trends of spring. Next week we will look at 3 more trends, Sweet and Girlie, The Modern Bohemian and the Bright color trend. And if there is room we can also talk about some spring trends that you can wear with all the clothing trends in shoes and accessories. So please keep reading and stay tuned weekly. If you are reading my blog weekly and enjoy it please let me know! Also if there are suggestions for blogs I would love to hear them. I am writing blogs right up until the end of April and then taking a break for May, so I promise we will cover everything for spring before then. As always, I can be reached at Suethefashionista@gmail.com.